External marble statuary is a central feature of many historic and contemporary landscapes. As well as statues, often depicting allegorical figures, a wide variety of decorative ornaments, water features and furniture can be found in gardens, parks and urban spaces. Taking their lead from examples on the continent, British designers and architects started to incorporate key pieces of decorative work into carefully constructed landscape designs at the end of the 17th century. Initially, objects were imported from abroad and installed as aesthetic and intellectual focal points in increasingly complex schemes. Commissions carried out by celebrated European carvers and the rise of increasingly skilled and fêted homegrown talent, saw this trend continue throughout the 19th century as the fashion for neo-classical pieces flourished. Derived from the Greek marmaros meaning a white, shining stone, ‘marble’ is used to describe a metamorphic rock formed from limestone (CaCO3) which has been broken down under considerable pressure and heat before cooling and recrystallising, producing a granular mosaic of calcite crystals of roughly equal size. During this process, the original sedimentary elements of a limestone are lost and the resultant pure marble is therefore monomineralic, free from fossils and white in colour. However, small amounts of impurities are often incorporated with the calcite during this metamorphism, resulting in the vast range of coloured marbles. Marble is found and quarried across the globe but Italy has long been the primary source for sculpture and ornament in Europe, with white statuary marbles such as Carrara being used extensively for external pieces. Unblemished by colour or pattern, marbles of this type were considered most suitable for the portrayal of human and natural forms in the ancient world, and the choice was reaffirmed in the Renaissance period. Although Britain has a long history of carving and exporting alabaster, the first examples of marble in this county were antiquities and newly carved imports from the continent, and it was not until the 18th century that marble statuary was being commissioned and carved here. Biological growth, such as algae and lichens, thrives in the damp climate of the British Isles, resulting in persistent surface soiling to all external stonework but is particularly visible on marble. As the surfaces become gradually more eroded, roughened and porous by repeated weathering cycles, bio-colonisation becomes more prominent and tenacious. As with all calcite stones, the major causes of the decay of marble in an external environment are direct surface erosion through wind and rain, soluble salt crystallisation, etching by acids in the environment, and frost damage. The initial deterioration of finely finished marble surfaces is caused by thermal and hygric fluctuations. A non-reversible deterioration both at and below the surface occurs through the formation of microcracks which are then subjected to increased moisture uptake. Studies of daily temperature and moisture levels in northern Europe have concluded that the wide fluctuations which occur throughout the year have significant effects on marble deterioration levels. composition of marble makes external sculptures highly susceptible to atmospheric weathering, and marbles with a high calcite content such as Carrara are particularly sensitive to acidic environmental conditions. When dissolved in moisture, carbon dioxide, nitrogen oxides and sulphur dioxide (the latter from burning coal and volcanic activity) form weakly acidic solutions which can cause the breakdown of the stone. Other products of pollution include particulates of carbon and tar which cause dirt and staining. The deposition of atmospheric particulates, particularly from the height of the industrial revolution until the Clean Air Act in the 1950s, led to the formation of thick, hard, unstable gypsum crusts on areas of surface which are sheltered from direct rainwater washing. Under these crusts, sugar-like friable subsurface marble formed through repeated dissolution and recrystallisation of salts, leading to the loss of intergranular cohesion. An additional cause of accelerated decay has been the use of inappropriate repair materials, most obviously hard cementitious mortars, which form a relatively impervious barrier and introduce damaging salts into the marble. Considerable damage can also be caused to marble by the corrosion of metal, with expansion and staining of ferrous fixings being a common problem. The staining associated with iron corrosion is both visually disruptive and can also be the first indication of a more serious issue. Cracks and splits caused by expanding iron often lead to material damage and loss of structural integrity, as well as increased moisture ingress. Although copper and bronze fixings do not increase in size through corrosion, extensive staining to marble is a common problem. The conservation of deteriorated external marble involves a complex set of judgements which will include effective and appropriate methods for cleaning, consolidation, repair and protection. A full inspection and understanding of the condition of an object is always required before establishing a programme of works. Cleaning may be required to restore the visual integrity and uniformity of a marble surface, particularly in the case of figurative or highly decorative pieces. The removal of damaging sulphate deposits and metallic staining may also be a priority. Removal of superficial surface soiling can be carried out by simple dry brushing and the use of water and steam on a controlled scale. Steam cleaning can be carried out using small portable dental cleaners, which allow very controlled cleaning to be carried out at a pressure of around 3–5 bar (40–75 psi). Larger scale steam cleaners such as the Doff or Thermatech systems are controllable enough for use in cleaning external marble pieces where, for example, removal of tenacious bio growth or rinsing after poulticing is required. The use of high temperature steam is also thought to sterilise the surface, thus slowing down future biocolonisation. Careful examination of the marble is required prior to this treatment though, and only sound surfaces should be cleaned by this method. by the application of ammonium carbonate poultices. (These should be used sparingly with as few applications as possible to prevent over-saturation of the marble). sulphation residues and, in the case of water features, hard lime-scale deposits. It is worth emphasising that the many proprietary marble cleaning products available have mostly been developed for the maintenance of new architectural surfaces and are not suitable for use on marble statuary. Usually highly alkaline or acidic in nature, they can be relatively effective at cleaning marble but do not allow the degree of control necessary for sensitive cleaning of sculptural surfaces.They can also leave damaging residues on the surface and introduce harmful salts. The removal of most types of metallic staining, however, requires the use of chemicals. Many conservators have in the past produced ‘field’ mixes, but a few suitable proprietary products are available which have been carefully formulated for historic surfaces. Tests should always be carried out and the manufacturer’s instructions strictly adhered to. 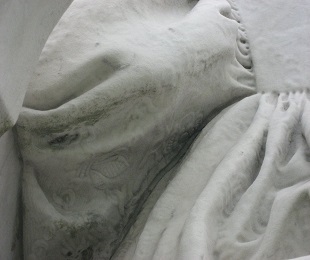 Dealing with disaggregated marble poses a considerable challenge for conservators. As with all stones, effective consolidation of deteriorated marble is difficult to achieve in practice, particularly externally where control of environmental fluctuations is usually impossible. Some degree of success has been achieved with the use of ammonium oxalate to convert degraded calcium carbonate into calcium oxalate. This treatment has both consolidating and protective properties. Deteriorated calcium carbonate is converted to calcium oxalate which is harder and more resistant to acid attack, with a lower solubility than calcium carbonate and with an improvement in surface cohesion occurring after treatment. This means that extremely friable, quite sugary areas of marble can be consolidated and strengthened allowing sacrificial mortar repairs and sheltercoats to be applied. Carved features that have become loose or detached through deterioration, vandalism or accidental damage may require drilling and pinning. Depending on the structural characteristics of a repair, broken elements can be re-attached where necessary using austenitic grade stainless steel, carbon fibre or perspex rod set in polyester or epoxy resin. be stable in UV light and able to endure environmental fluctuations if used in external locations. Resin fills often look excellent in the short term but fulfil few of the criteria necessary for long-term sustainability in external situations. Traditional lime mortars, mixed with fine aggregates and, sometimes, earth pigments, have proved to be the most compatible fill materials. lighting and environmental conditions can be manipulated and controlled. 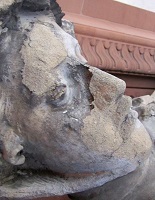 They have also been used in small quantities for filling fine cracks in external sculpture where standard lime-based treatments have proved ineffective. In recent years, however, the development of dispersed nanolimes capable of penetration into fine cracks has enabled new possibilities for more compatible treatments. Proprietary resin-based products, which may have some useful qualities such as lightfastness and general durability, should not be used for the repair of marble statuary. They are generally developed and marketed for filling flaws and damage to new marble elements such as floor tiles and wall cladding and will inevitably fall short of the criteria outlined above. There are also distinct drawbacks in inserting carved indents into weathered sculptural objects. Any new addition, which in standard conservation practice should be carved to the level of the original uneroded surface, will inevitably sit awkwardly with adjacent weathered surfaces. There is also likely to be an excessive loss of sound original material required to fit replacement sections. Many materials have been used as protective surface coatings but few successfully and they are often cause damage. Waxes and oils have been found to readily discolour, attract particulate pollutants and reduce permeability, while materials like soluble glass (sodium silicate) which are used to make the surfaces less porous, damage the marble by trapping moisture. Once applied, these materials are difficult to remove. Readily available proprietary products such as lacquers, water proofers and ‘hard waxes’ should not be used for external statuary and sculptures. Hydrophobic treatments have been favoured for their reversibility but any applied layer that is impervious to water can prevent surface evaporation, trapping any soluble salts within the marble leading to subsurface degradation. A standard conservation practice, which is regarded as effective and suitably benign, involves the application of a thin layer of microcrystalline wax which can provide some protection to marble surfaces in semienclosed,unregulated environments such as grottos and colonnades. One surface coating which is compatible with marble is a lime sheltercoat. This can be applied to eroded roughened surfaces to fill pores and cracks as a sacrificial layer, decaying preferentially to the stone itself. It is highly probable that new compatible coatings for marble will follow soon from developments in nanolime technology. Although it has been noted that climatic conditions throughout the year can contribute to the deterioration of marble, it is theweather during the winter months that causes the most concern for those entrusted with caring for external marble pieces. One solution which is frequently employed is to provide an object with a temporary form of protection. At present, winter covers take many forms from close wrapping (usually in waterproof but vapourpermeable sheeting), blankets, duvets and sleeping bag assemblages, tent-like structures and bespoke wooden boxes. There appears to be no firm consensus what is the best approach with some conservators favouring maintaining some degree of airflow and others championing an airtight seal. preventing the marble from being subjected to the worst of the climatic conditions. It is thought that a vapour-permeable membrane can provide a degree of protection against prolonged and repeated saturation, but they entail considerable expenditure both in terms of labour and materials and the jury is still out on their effectiveness. Research into this aspect of conservation is ongoing and it is hoped that a comprehensive set of observations and guidelines may soon be forthcoming. In the meantime the use of winter covers, in whatever form, should always be accompanied by close inspection, recording and photographic documentation at all stages. The condition of the object should always be carefully checked before covering and again when the cover is removed. There are also instances where sculptures are temporarily moved and displayed inside or placed into storage. As with winter covers, this can often be an appropriate approach particularly when locations are closed or public access is restricted during winter months. There is, however, always a risk in moving any sculptural or ornamental feature and any programme of moving should always be carefully assessed and planned and only carried out by experienced and trained staff. Ideally, statues and other decorative features should always be displayed in their original locations. However, there will inevitably be a point when an object is deemed to be in danger of catastrophic deterioration and an argument will be put forward for permanent removal into a more controllable environment. This poses the question of what to put in its place. Like-for-like replicas carved in marble by hand in the traditional manner often rely on the knowledge and skill of a carver to interpret what may be quite badly eroded and softened detail. Making casts from moulds is a common approach, with casting material based on cementitious mixes. Cement lacks the crystalline qualities of marble but acrylicmodified cement casting composites (such as Jesmonite) can be closely matched to natural stones. Taking moulds from an already friable surface can be a precarious and, in the wrong hands, damaging process. State-of-the-art scanning and cutting techniques (including laser and water jet) now allow very accurate replicas to be produced in a range of natural and artificial materials. In conclusion, the conservation of external marble statuary presents a complex set of decay mechanisms and treatment options. For objects that are in reasonably sound condition or which have undergone conservation treatment, straightforward procedures such as regular inspection and maintenance are essential and the use of winter covers should also be given serious consideration.